We are in our 10th year of providing low-cost spay/neuter clinics for cats, offering a much-needed service for our community. Two breeding cats potentially produce more than 420,000 cats over seven years — and we have spayed or neutered almost 3,700 cats since we started! We have done so without any grants or governmental funds. There is always a need in our area, which we see every time our tireless volunteers hold a clinic. 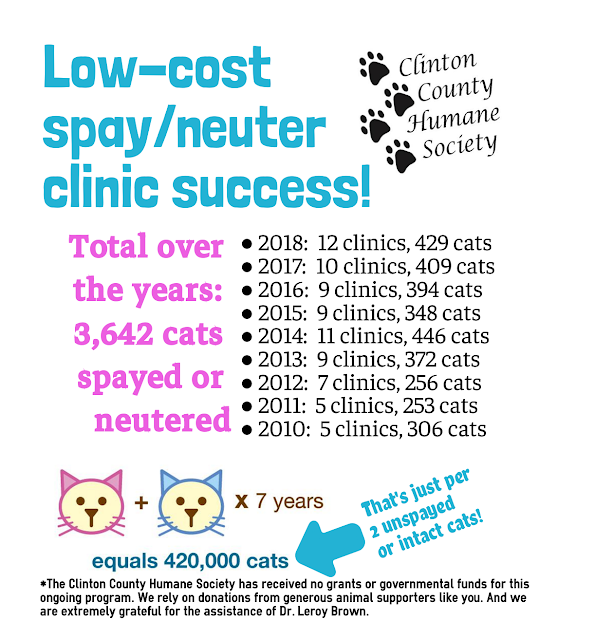 Please consider donating to help our shelter continue to help Clinton County — even the smallest amount helps. Thank you for your support. You can also donate via PayPal on our website,clintoncohumanesociety.org or by check mailed to 1760 Fife Ave., Wilmington, OH 45177. Also, please share this post!